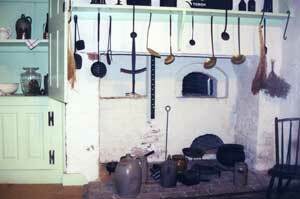 Early beehive ovens were located within the hearth, later they were built to the side of the hearth. A fire is started within the oven for several hours. The coals and burning wood are removed, with only the heated bricks used to bake. The picture is of the oven within the hearth at Chief Justice Roger Brooke Taney and Francis Scott Key Museum, [law partners and brothers-in-law] in Frederick, Maryland. Page being redone, many sites to be added.